Welcome to Spirit Song Alpacas! 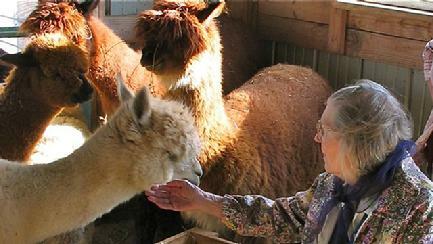 We have experienced the satisfying alpaca business for the past seventeen years. We have enjoyed the whole array of facets: breeding, birthing, raising, nurturing, showing our alpacas, and most of all, we have appreciated the delightful relationships we have had with our beloved alpacas. We have down-sized our herd, and are now focusing on fiber. In the midst of life's changes, our alpacas have given us a kind of stability, which has grown out of our commitment to these gentle animals and to a way of life. They have taught us to be attentive to the details of life: the importance of water and good nutrition; the subtle changes that occur when one's health is not quite right; that one's behavior can communicate a lot of information to those who listen and observe; that it takes time and much patience when waiting for a dam to give birth, and the signs of her approaching delivery may not always be obvious or dramatic; and perhaps most important, when the basic needs of our existence are covered, life is very good. We have a number of alpacas for sale, and are willing to negotiate on prices. If you cannot attend our open farm event please call and arrange a farm visit. Do You Want to Learn More About Alpacas? Sunday, September 24, 2017, 11am - 4pm. Come and hang out with the herd. We look forward to seeing you! We are conveniently located one hour north of Minneapolis and St. Paul, Minnesota. To schedule a farm visit, please call or email us. 2010 -2017 copyright © Spirit Song Alpacas. All rights reserved.